"This is a recipe that I created and it is actually very good! You can use other fruits like raspberries and blackberries. Make sure to cut the apples nice and small and bite-size. You may like to try the tortillas warm for only a few seconds. Enjoy with a friend." 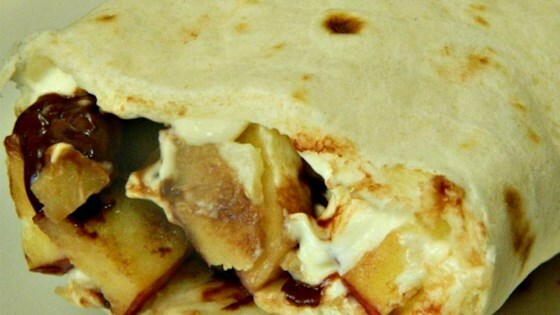 Spread cream cheese onto each tortilla. Sprinkle apple and chocolate chips over cream cheese. Fold opposing edges of the tortilla to overlap the filling. Roll 1 of the opposing edges around the filling into a burrito.